WASHINGTON (AP) -- Democrats will "never" see President Donald Trump's tax returns, said White House chief of staff Mick Mulvaney on Sunday, as a new front opened in the confrontation between the administration and Congress. Mulvaney accused Democrats of engaging in a "political stunt" and wanting "attention" after the chairman of the House Ways and Means Committee, Rep. Richard Neal, asked the IRS to provide six years of Trump's personal tax returns and the returns for some of his businesses. "That is not going to happen and they know it," Mulvaney told "Fox News Sunday." Asked whether he believe Democrats would ever view the president's returns, Mulvaney replied: "Oh no, never. Nor should they." Last week, Massachusetts Democrat Neal, one of only three congressional officials authorized to request tax returns, requested Trump's personal and business returns in a letter to IRS Commissioner Charles Rettig. He asked for returns covering 2013 through 2018. He also asked for the documents in seven days, setting an April 10 deadline. An obscure 1924 statute includes no exceptions to Neal's authority to ask the Treasury Department for returns and says the department "shall furnish" them when requested. It does require that the review of an individual's return be conducted by members of Congress in "closed executive session" if the returns are provided without the taxpayer's consent. Still, Mulvaney claimed the law provides for lawmakers to review individual tax returns but "political hit job is not one of those reasons." His comments echoed those made by Trump's lawyers who argued the Democratic request "would set a dangerous precedent" if granted. Trump broke with precedent when he chose not to release any tax returns as a presidential candidate. Mulvaney tried to cast the issue of the president's taxes as old news, saying it was "already litigated during the election" and the American people "elected him anyway." Trump has said he won't release the information because he is under audit, something he reiterated again Friday while visiting the U.S-Mexico border. "I'm under audit. When you're under audit you don't do it," Trump said. IRS officials have said taxpayers under audit are free to release their returns. Trump claimed at a news conference following his election in November 2018 that the filings are too complex for people to understand. William Consovoy, whose firm was retained by Trump to represent him on the matter, said in a letter Friday to the Department of Treasury's general counsel that the tax code zealously guards taxpayer privacy. He said requests for tax returns "must have a legitimate legislative purpose." Neal has said he made the request to review the IRS policy of auditing the tax returns of all sitting presidents and vice presidents, saying, "little is known about the effectiveness of this program." 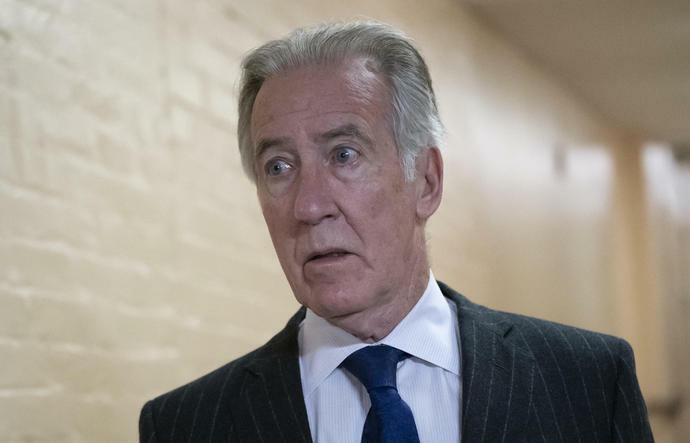 "On behalf of the American people, the Ways and Means Committee must determine if that policy is being followed, and if so, whether these audits are conducted fully and appropriately," Neal said when unveiling his request for Trump's returns. Utah Sen. Mitt Romney, the GOP's 2012 presidential nominee who has been an occasional critic of Trump's, called Democrats' actions "moronic." He told NBC's "Meet the Press" that he believes Trump should release his tax returns, but by demanding them, "I think the Democrats are just playing along his handbook." WASHINGTON (AP) - Former Vice President Joe Biden formally joined the crowded Democratic presidential contest on Thursday, declaring the soul of the nation at stake if President Donald Trump wins re-election.